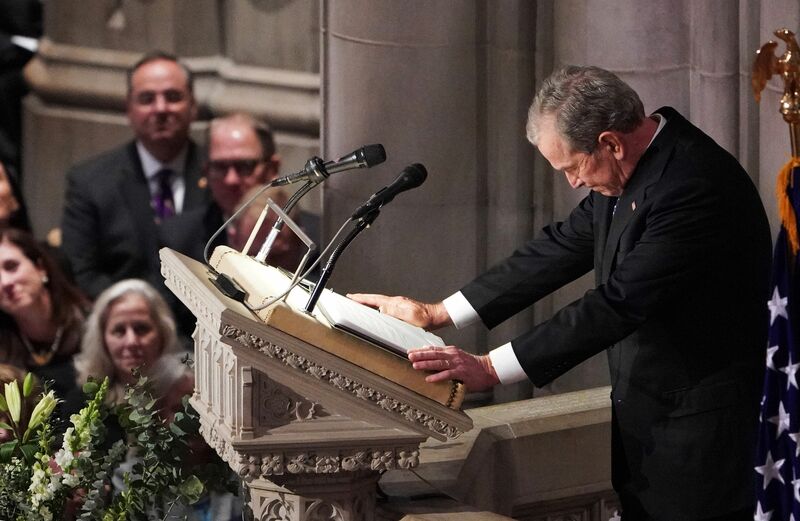 Five living presidents were seated together Wednesday at the funeral of former President George H.W. Bush earlier this week. The interactions between the contentious political elite were polite and gracious. In spite of sparring publicly for years, both President Donald Trump and former President Barack Obama shook hands and greeted each other. Trump also shook hands with former first lady Michelle Obama. 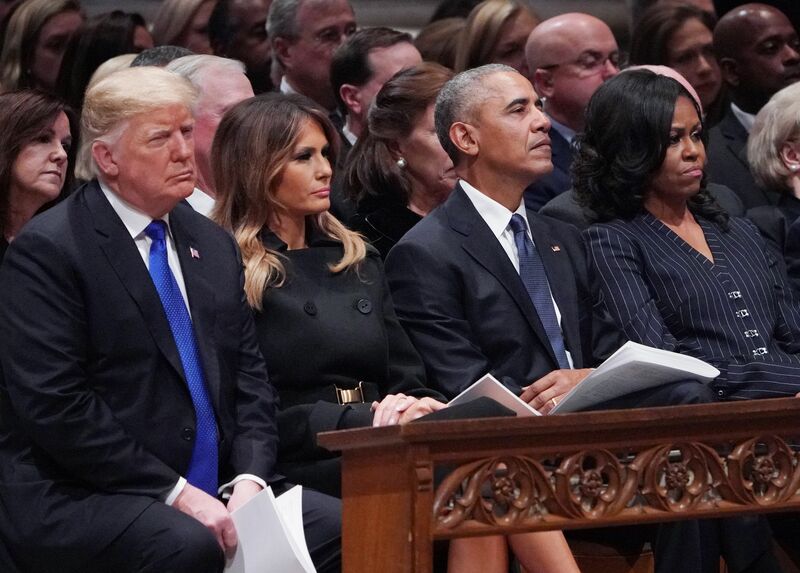 Melania Trump received the front row of the National Cathedral with her greeting of the Obamas and former president Bill Clinton, who shook her hand. Still, it was infuriating to see the Obamas graciously engage with the man who spent years vociferously promoting the racist conspiracy theory that the former president is a Muslim who wasn’t born in the United States. Also recall that Donald Trump repeatedly challenged Obama to produce his college-admissions records — because it wasn’t enough for Trump to try to invalidate Obama’s presidency, he had to question Obama’s intellect. In her recently released book, “Becoming,” Michelle Obama writes that she will “never forgive” Trump for spreading the “birther” conspiracy. But the Obamas didn’t have the luxury of treating Trump the way, for instance, Hillary Clinton did at the service. She looked like she would have rather sawed off her arm than acknowledge the Trumps. She gave the president and first lady a slight nod as they took their seats. Considering that Trump is still calling for Clinton to be investigated and jailed, the cold reception was predictable and warranted. But had the Obamas behaved like Clinton, they would have been accused of grandstanding and dividing the country even more than it already is. Or pundits would have said they lacked the grace and decency befitting a couple who once occupied the White House. A video clip of two black people showcasing visible anger toward the president would have been played over and over again on cable news. Hill was suspended from her former job at ESPN for calling the President a “white supremacist.” She was ultimately fired by the network.